Tired of scrolling through your iPad photo gallery to find a favorite photo or two? Need to pull together photos from your PC, Dropbox, and digital camera into a seamless photo gallery? Want to quickly and easily organize photos by date, title, and tags? PicStory’s iPad app lets you streamline all of your digital photography with attractive interface and intuitive navigation. The PicStory iPad app opens with a lovely stock photo to serve as the background for the photo galleries you will create. You can change the background image into an existing photo by touching the paintbrush icon in the top right corner of the screen. There is an icon in the middle of the bottom of the screen to allow you to add a photo album. The shape of a file folder slides onto the screen, and the home screen softens. The top edge of the file folder allows you to add a title, date, and tags quickly. The tagging interface allows you to add a text or image tag. A field to add a custom tag is included and easily accessed. The image tags may be weather, family, landmark, and popular name brands. They’re fun, but it would certainly be a nice bonus to add a photo of each of your children for a custom image tag. Just below these tools, there is a menu bar with icons for different photo sharing services. The same menu bar is placed vertically along the left side of the file folder. You can add photos from Dropbox, Picasa, iTunes, and your camera roll. Thumbnails of the photos for each album are arranged in a matrix. You can tap multiple photos, then add them all at once. You simply press save when complete. The loading, processing, and updating is quick and surprisingly easy. 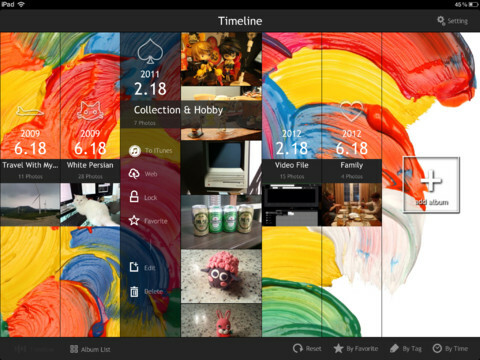 Your photo galleries are arranged by date on your PicStory iPad app home screen. You tap the gallery, and thumbnails of the photos pop up to be accessed with horizontal finger swipes. You can favorite an album, upload it to Dropbox, Picasa, and iTunes, and password protect. You can also search your galleries from the bottom right menu bar on the home screen. Each search by tag, like, or time frame is accomplished with a smart pop-up. When you tap a photo to enlarge it from a gallery on the home screen, you encounter some unexpected tools and functions. You can create a slideshow, as well as add text and audio notes. There are icons in the top right corner that open a pop-up with logical, intuitive interface. For the slideshow gallery, you can touch the item on the list to customize. You can choose from eight transitions between images, select random order, add music, and adjust the time interval between images. Each slideshow can be shared to Facebook, Twitter, Dropbox, Picasa, and iTunes. You can also save it to your camera roll or email it. You can also add text and audio notes to provide further detail. You simply type the text and record up to five seconds of audio. The audio and text interface slides off the screen to the right, but can continue to be accessed by pressing the appropriate icon in the top right corner of the screen. The PicStory iPad app is a reasonably priced $4.99 download from the iTunes App Store. The vast functionality and ability to gather photos from a variety of sources is accomplished with such thoughtful design and navigation. 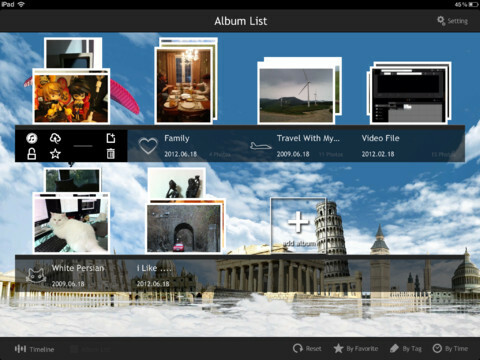 AppSafari review of PicStory – Photo Manager with Dropbox,Picasa was written by Jenni Ward on January 5th, 2013 and categorized under App Store, iPad apps, Photos, Productivity, Utilities. Page viewed 5461 times, 1 so far today. Need help on using these apps? Please read the Help Page.